The leading world expert on luxury beach hotels has spoken. The World Travel Organization selects those travel and tourism destinations and accommodations that are the best in the world. They have coronated Coco Reef Resort in Tobago as the “Caribbean’s Leading Hotel” for 2009. It overlooks the crystal clear waters of the Caribbean Sea and opens onto its own exotic white sand beach. It is regarded as the best of the best - the ultimate Caribbean luxury resort. The World Travel Organization awarded Coco Reef with the World Travel Award- the highest award in the hotel industry. In the travel and tourism industry, this award has received renowned acclaim. The Wall Street Journal describes it as “Travels industry’s equivalent to the Oscar’s”. Financial Times call it “The awards have been making a steady and significant long term impact”. Lanka Times salutes it as “The world’s most prestigious awards programme”. For its crowning achievement, Coco Reef has received lavish praise from publications around the world - far and wide; local and international. Standing atop of the Luxury Beach Hotels is not a fluke for Coco Reef Resort. It has been winning coveted awards for excellence consistently since 2004. It is a consistent out-performer among the best island hotels. It is the gold medalist among luxury beach hotels. Although it is constantly challenged and chased by stiff competition, Coco Reef manages to stay out front because its personnel never sit on their laurels. Coco Reef stays above and beyond the competition of 5 star beach hotels because they always regard themselves as a work in progress. Every year since opening in 1996, additions and improvements have been made in order to provide guests with an unforgettable holiday. This luxury Caribbean hotel is constantly pushing the envelope. If there was a category for best luxury lifestyle hotels resorts, Coco Reef would be crowned winner. The enchanted beauty coupled with the elegant and resplendent setting of this resort are enhanced by their outstanding service. The artistry of their service could be compared to a theatrical performance. Among fancy hotels and boutique beach hotels, Coco Reef is supreme. They are constantly striving for greater heights. The Coco Reef Resort in Tobago is set at the end of a palm lined driveway on ten acres of beautifully manicured tropical gardens. This tropical beauty is less than 5 minutes away from the island’s Crown Point Airport. This beach is everlastingly calm because of a barrier built to block the rushing ocean and with only a narrow inlet that lets in enough water to create what seems like a giant salt water pool. Some of the worlds biggest stars including Sylvester Stallone have been quests in its luxury hotel suites. It is also highly regarded in many categories such as luxury spa hotels, luxury boutique hotels and luxury honeymoon hotels. Additionally, if you do not want to stay in the main hotel, one can stay in one of the luxury hotels villas. Among luxury travel hotels, Tobago lays claim to several. Although Coco Reef is at the pinnacle of the ranking for all the Caribbean, there are others that also rate highly among luxury beach hotels. There is another that is a spirited contender to the coveted title of ultimate luxury resorts hotels among the many luxury beach hotels. Blue haven Hotel is that contender. As luxury travel hotels, it is a worthy rival for the title of best of all luxury Caribbean hotels. Blue haven was also nominated for Caribbean's Leading Hotel 2009. Unfortunately for them, there can be only one winner. 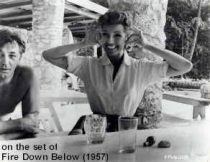 Here we can see Rita Hayworth and Robert Mitchum having fun on the beach during their stay at Blue Haven while shooting the movie Fire Down Below in 1957. This is one of the Older and more historic hotels on the island yet it has managed to stay modern and classy. The romantic Blue Haven hotel combines the atmosphere of the old nostalgic era with modern gaiety. Situated in the island’s capital, it has a most wonderful view overlooking the Atlantic Ocean. Blue Haven Hotel has a storied history and has been the preferred Caribbean destination for many world super stars and dignitaries over the years. In the 1950’s the legendary Blue Haven was the scenery for several movies.